Bonnie was born October 5, 1951 in Sheboygan, the youngest child of Lester and Bernice (nee Veldboom) Navis. She attended Green Elementary School, and graduated from Oostburg High School in 1969. She went on to study at Cosmetology School. On November 11, 1972 she was united in marriage with Dale Christenson at Hingham Reformed Church. The couple resided in Sheboygan Falls, where they raised their family. Bonnie worked for Gilson Brothers in Plymouth before starting at Thomas Industries (currently Gardner Denver Thomas) in the mid 1970’s. She proudly remained a dedicated employee there for over 40 years, retiring in April of 2018. 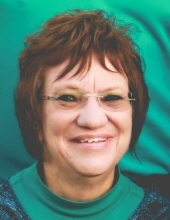 Bonnie was a longtime member of Faith United Methodist Church in Sheboygan Falls, where she had been involved in various capacities over the years. She enjoyed listening to Christian music, playing cards and dominos, walking, doing puzzles and attending dinner shows at Memories with her family. She routinely created meaningful puzzles, riddles and poems for her family, and genuinely loved talking with people to learn their life stories. In recent years, Bonnie and Dale spent their summers camping, most recently at Westward Ho. There, Bonnie made countless new friends and looked forward to golf cart rides, walks and time spent socializing around a bonfire. Above all, she cherished time spent with her friends, family and grandchildren, and was looking forward to the arrival of 2 more grandchildren this summer. She was a selfless, caring and giving woman who was always concerned with making sure everyone else was taken care of before herself. Bonnie is survived by the love of her life and husband of 46 years, Dale; their sons Ryan (Michelle) of Sheboygan Falls and Travis (Tiffany) of Oostburg, her grandchildren that she adored: Lyndsie, Rylan and Graysen and 2 grandbabies on the way. She is further survived by her siblings: Jean Neerhof of Cedar Grove, Karen (Jim) Wilterdink of Hingham and Ron (Darlene) Navis of Cascade; 2 sisters-in-law Sue Titel and Debbie (Jim) Schaller, both of Sheboygan Falls, nieces and nephews: Scott (Sue) Neerhof, Michelle (Kevin) Lucas, Lori (Randy) Stadler, Jana (Curt) DeBlaey, Denise (Steve) Foerster, Sue (Phil) Becker, Jodi (Tony) Lopez, Brian (Marlene) Wilterdink, Mike Navis, Nicole Navis, William (Amy) Navis, Sheila (Randy) Harshberger, Tammy (Scott) Walsh, Sherri (Dale) Colberg and Wendy (Doug) Sass, aunts Vivian Veldboom and Mildred Rauwerdink, both of Sheboygan Falls, and countless other relatives and friends. She is preceded in death by her parents, parents-in-law Gene and Betty Christenson, brothers-in-law Robert Neerhof and Rudy Titel and nephew Aaron Wilterdink. Funeral Services will be held at 6PM on Friday, April 5, 2019 at Zimmer Westview Funeral and Cremation Care Center, W2132 Garton Rd (Hwy 42 & JJ) in Sheboygan. Pastor Kathy Reid will officiate. The family will receive visitors at the funeral home on Friday from 3:00-6:00PM. She will be laid to rest at Sheboygan Falls Cemetery. In lieu of flowers, memorials are suggested to a memorial fund being established in Bonnie’s name. The family would like to thank Dr. Coulis, Dr. Bettag and Dr. Parikh for their compassionate and supportive care of Bonnie and her family during the time of her illnesses. To send flowers or a remembrance gift to the family of Bonnie L. Christenson, please visit our Tribute Store. "Email Address" would like to share the life celebration of Bonnie L. Christenson. Click on the "link" to go to share a favorite memory or leave a condolence message for the family.